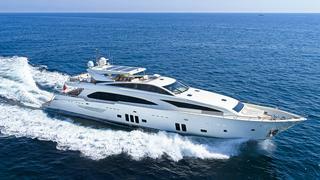 The 36.8 metre motor yacht Arion, listed for sale by Bob Anslow at Denison Superyachts, has been sold with Juan Morillo at United Yacht Sales introducing the buyer. Built in GRP by French yard Couach,Arion was launched in April 2011 as the sixth hull in the yard’s popular 3700 series. A chic interior by designer Ken Freivokh uses cherry and wenge woods contrasted with suede and white lacquered panels to create a warm but highly functional atmosphere throughout, accommodating up to nine guests in four cabins. These consist of a full beam master suite, a VIP suite on the main deck, a double and a twin with a Pullman berth, and all cabins have full en suite facilities. The saloon is open plan and in the aft area has a large sofa, occasional chairs and an entertainment centre including a 50 inch LCD television screen. Forward is a dining area with formal seating for eight to 10 guests while al fresco entertaining and dining is available on the aft deck, seating up to 12 guests around a large dining table. Like all Couach yachts, Arion is a real cruiser with a long-range capability and a high-performance hull, which can comfortably cruise at 25 knots even in rough seas. Fitted with the latest generation of gyroscopic stabilisers by Seakeeper, the yacht is extremely comfortable at anchor and at sea. Lying in Cannes, France, Arion was asking €5,425,000.